Under the auspices of Prof. Tarek Taha, the Dean, the faculty of Financial and Administrative Sciences holds the 9th Job Fair on Monday,15 April, 2019 at the Student Theatre. This is held from 10 am to 3 pm. The coordination of the job fair is managed by Dr. Nagwa Mohamed, the Leader of Student Activities. A number of distinguished companies will participate in the fair. Under the auspices of Prof. Fawzi Abdel Ghani, the Dean of the faculty of Mass Communication, a seminar entitled “The Pros and Cons of Being a PUA Mass Communication Graduate” was held on Tuesday 30/10/2018. This seminar was held within the framework of the faculty’s constant endeavours to strengthen the ties with the alumni and provide support to them. The seminar was given by Associate Prof. Ragaa El-Ghamrawy who teaches at the Radio and Television Department and Ms. Amal Sobhy, a senior TV presenter at Alexandria Channel. 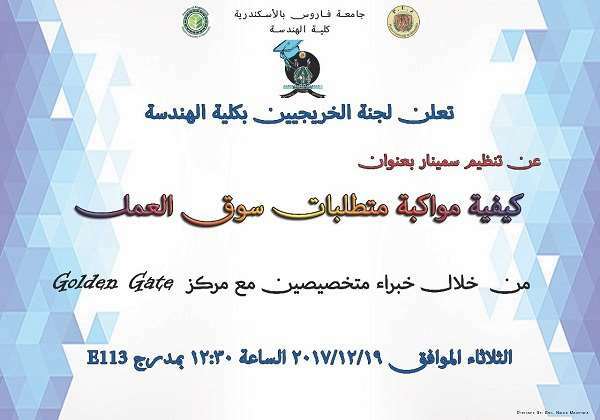 The coordination of the seminar was managed by Dr. Lamiaa Hassan, a lecturer at the Radio and Television Department and the Demonstrator Shaimaa Ibrahim. The alumni association of the faculty of Engineering –Pharos University holds a seminar on getting the faculty graduates acquainted with the essential prerequisites for establishing small-scale enterprises along with passing the experience of the consultancy offices on to them. The seminar is given by expert lecturers in meeting the requirements of the labour market. This is held on Tuesday 19/12/2017. In celebration of the holy month of Ramadan, the alumni association of the faculty of Engineering held the 1st group iftar on campus for the faculty alumni on Tuesday 6/6/2017. The iftar party was held under the supervision of Prof. Mohamed Gaber, the faculty Dean. At the outset, the faculty graduates gathered in front of the faculty building to take a group photo for memory’s sake, then they headed for the faculty of Tourism and Hotel Management restaurant simulation area to have iftar party. About 65 of the faculty graduates, from all departments and classes, attended the group iftar party alongside a number of faculty members, teaching assistants and some community parties in a cordial atmosphere. 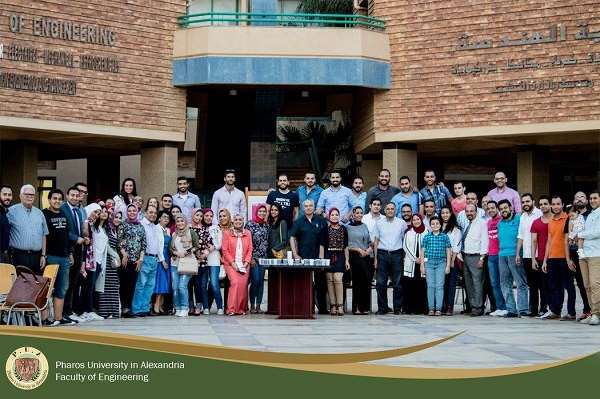 The idea of the Alumni day is initiated by Alumni Association so as to create a convenient way to reunite the graduates in order to create a social, cultural and professional interaction between the graduates of the Faculty of Engineering – Pharos University. This reunion took place on Thursday 19/2/2016 at Al Fanar Hall – PUA. 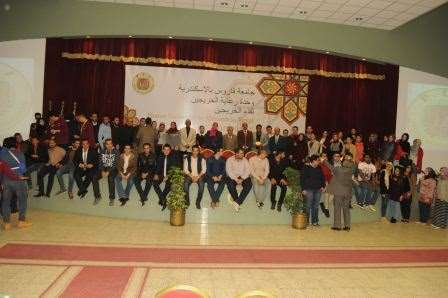 The President of Pharos University, Dean of the Faculty, staff members and the graduates of the Faculty of Engineering (2011-2015). 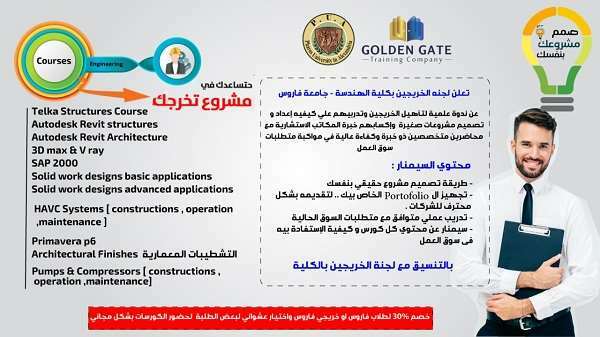 Encourage constant communication between the graduates and their university so as to benefit from exchanging experiences. Moreover, the CVs of the graduates are collected in order to assist in finding suitable jobs for them. The idea of the Alumni day is initiated by Alumni Association so as to create a convenient way to reunite the graduates in order to create a social, cultural and professional interaction between the graduates of the Faculty of Pharmacy and Drug Manufacturing – Pharos University. This reunion took place on Thursday 12/11/2015 at Al Fanar Hall – PUA. 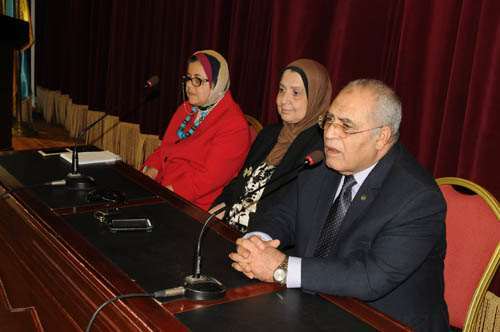 The President of Pharos University, Dean of the Faculty, staff members and the graduates of the Faculty of Pharmacy and Drug Manufacturing (2011-2015).